We've been honored with some of the nation's most prestigious PR and online marketing awards. We're proud of our awards, but client satisfaction is what drives us to excel. 4GreenPs will be honored for our work with Share Our Strength at the National Press Club this March as PR News "salutes the winners and honorable mentions of a distinguished circle of those holding the key to best practices in the nonprofit communications arena. This must-attend industry event will honor the top nonprofit PR campaigns of the year, the smartest communications initiatives and the people behind them." 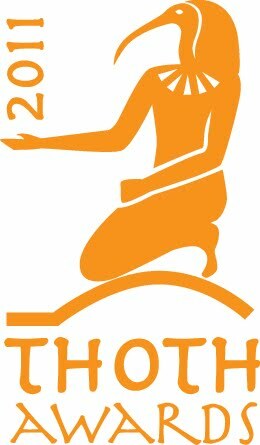 The Thoth Awards are a competition honoring talent and innovation in marketing and communications in the capital area. Named after Thoth, the ancient Egyptian god of wisdom associated with writing and communications, the prestigious awards are hosted by The Public Relations Society of America's National Capital Chapter. 4GreenPs won a Certificate of Excellence in the Online Communications category in partnership with Pat Lute PR for work on behalf of FRESHFARM Markets, promoting DC-area farmer's markets through social media and online communications. We won the Shorty Award, also known as "the Oscars of Twitter," in 2009 for our work with the Green Moms Carnival. The Shorty Awards are named for the brief nature of communication on Twitter - tweets are composed of 140 characters or less. We won the 2011 PRNews NonProfit PR award for a record-breaking fundraising campaign with The National Children's Center (NCC). Bucking the national trend for donations to health nonprofits, 4GreenPs helped the "52 in 52" campaign increase in-kind and cash doantions by 71% and triple the number of families served in their respitality program. 4GreenPs also initiated the first-ever blogger outreach program, improved targeted messaging and outreach, and saved resources by going without expensive direct mail outreach. Earth & Industry - 1 of 16 "Women You Must Follow For Green Business"
Lynn was included on Earth & Industry's list of 16 "Women You Must Follow For Green Business," showcasing her voice as both @OrganicMania and @4GreenPs. The very best awards are kind words from our many happy clients. 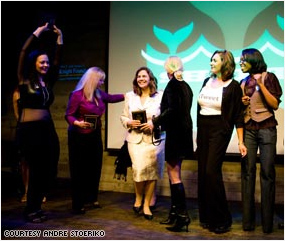 Lynn Miller (center) having a great time accepting the Shorty Award on behalf of @GreenMoms (photo credit: CNN).